A superb range of machines for your sports ground preparation. POWEROLL manufacture the largest range of ride-on sports field rollers in the world. Rollers are available to meet most budgets and requirements; with some new machines costing less than fully reconditioned old ones. Poweroll rollers are used at all standards of play and on all grass surfaces, including county cricket, top lawn tennis and village cricket clubs. They are owned by sports clubs, schools, colleges, local authorities, contractors and plant hire companies. POWEROLL machines are all designed to receive water ballast into the precision machined drums, and, all except the model 5 incorporate additional water ballast tanks. This allows the grounds man to start the season with a light-weight machine and add ballast as the season progresses, removing the need for a separate machine. Here is a brief introduction to each model, click on a thumbnail for enlarged pictures and full descriptions. 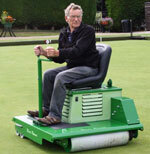 The Poweroll Bowling Green Iron The Blade Runner has been designed to smooth the playing surface without increasing compaction.